Ebac 3850e Dehumidifier Review - The Best for Large Homes? With its 21 litres per day extraction capacity, the Ebac 3850e is one of the most powerful refrigerant dehumidifiers we’ve reviewed. It also has a number of interesting features, such as a digital LED display, “Smart” technology and air purification mode. How quickly does it really extract water from the air though? And is it worth the money? Keep reading our Ebac 3850e review to find out. The Ebac 3850e dehumidifier is one of the most powerful available for home usage. It can quickly reduce moisture, condensation and even mould - and the energy saving features help keep your electricity bills as low as possible. It's bulky and less portable than other options though. We’re big fans of Ebac’s style, and the 3850e is no exception. It’s a stylish model with a curved outer cover and dark blue sides. The digital control panel also provides a more modern appearance than most dehumidifiers. The dimensions of the machine are 42.x cm x 50.6 cm x 27.3 cm (WxHxD). It’s not the bulkiest dehumidifier on the market, but it’s deeper than the majority of models we’ve reviewed. Be prepared for it to stick out from the wall more than others – especially as it needs space between the back and the wall for circulation. A bonus is the Ebac comes with a 2.1 metre power cord. This provides plenty of scope to place the dehumidifier wherever it’s needed. The 3850e has a 2.5 litre water tank. 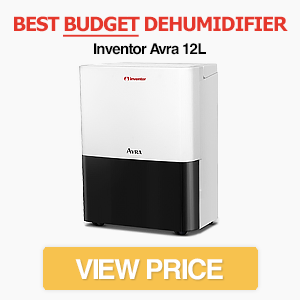 This is around average for a home dehumidifier, but is smaller than we would expect from a model with a 21L extraction capacity. The Meaco Low Energy 20L, for comparison, has a 6 litre tank. It’s also considerably smaller than the 3.5 litre tank that comes with the Ebac 2650e. For this reason, be prepared to empty the 3850e regularly. There’s the option of using an external drainage pipe though, which could be useful if you’re using the dehumidifier in the basement, garage or other area where it could fill up without anyone noticing. You’ll need to purchase the hose kit separately though. Another issue is that it isn’t easy to see the current water tank level. There’s an indicator when it’s full, but you can’t quickly see how close it is to needing to be emptied. On the plus side, the Ebac has a front loading water container. We always prefer models with this feature, as it allows you to empty the dehumidifier without moving the machine. One of the biggest downsides of the Ebac 3850e is that it’s less portable than other options. It’s heavy and bulky, with a weight of 13kg, so it’s not a machine you’ll want to carry up and down stairs on a regular basis. There is a carry handle at the back of the machine, which makes carrying easier. It’s still one of the worst dehumidifiers for portability though – especially as there are no castor wheels. On the plus side, the rapid extraction rates (see the “Water Extraction” section) mean you probably won’t need to move it too much anyway. Ebac calls the 3850e its “most powerful dehumidifier” – and with a high 21L per day extraction capacity we’re inclined to agree. 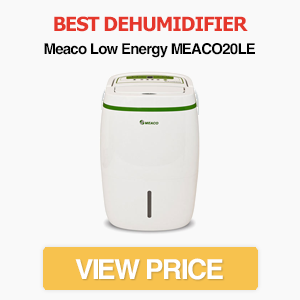 In fact, it has the highest maximum extraction rate of all our dehumidifier reviews so far. Does it live up to expectations though? Fortunately, it’s great at removing water from the air in warm conditions and can quickly dry out your home. The high extraction rate also means it’s fantastic for large homes. Additionally, Ebac is so confident in their product that they offer a “100% 30 day condensation cure guarantee”. It’s also an excellent choice for preventing the growth of surface mould – especially in rooms with bad circulation. It’s worth noting the 3850e is particularly good at room temperature or above. When the temperature starts to drop, however, it becomes less effective. This is to be expected with a refrigerant dehumidifier, but means it’s probably not the best choice for garages or unheated rooms. Even though it’s less effective at lower temperatures, the 3850e can still operate down to 3 degrees Celsius. This is reasonably low for a refrigerant. The 3850e is a large and powerful dehumidifier. It’s not the most portable, but it makes up for this with the quantity of water it can remove from the air. For this reason, it’s perfect for relatively large homes with up to five bedrooms. Refrigerant dehumidifiers tend to be louder than desiccant models. On its normal setting, the Ebac 3850e has a noise output of 46dB. This is relatively loud and you probably won’t want to be in the same room while it’s running. There is a quiet mode though. This reduces the noise output at the expense of a slower water extraction rate. 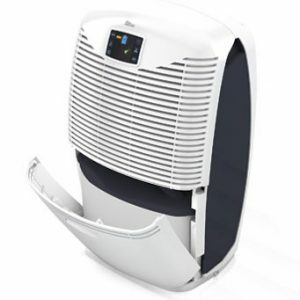 One of the most important factors when choosing a dehumidifier is energy efficiency. For this reason, Ebac has included their “Smart Technology” with the 3850e. This is effectively an “auto” mode that monitors the environmental conditions to detect when the dehumidifier needs to be turned on. The result is the Ebac is great for energy efficiency. 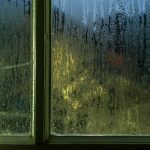 It can remove large amounts of moisture from the air without racking up your energy bills, which will be a relief if you’re using it to dry a damp home. It has a maximum power consumption of 320W, but this is when high power and fan speed modes are active. Ebac has also attempted to improve the defrosting energy efficiency of the dehumidifier. Refrigerant dehumidifiers often struggle in cold temperatures, as ice develops on the coils. Ebac has attempted to minimise wasted energy by including an “Intelligent Defrost” system with the 3850e. This identifies when the dehumidifier isn’t working efficiently due to ice and starts defrosting before the efficiency drops any further. The result is less downtime and reduced wasted energy. 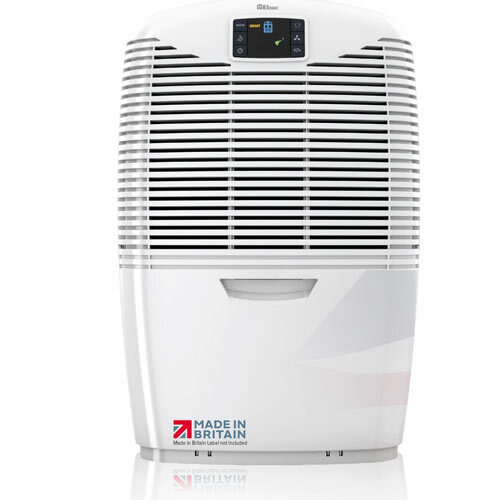 This feature makes the Ebac better suited to the British climate than other dehumidifiers. It’s also manufactured in the UK which is great to see. One of the most interesting features is the air purification mode. When switched on, the dehumidifier removes dust, pollen, smoke and other allergens from the air. When in air purification mode the dehumidifier doesn’t extract water though. The filters are changeable if they become damaged or clogged. Ebac recommends changing these each year, so this adds to the total cost of the machine though. 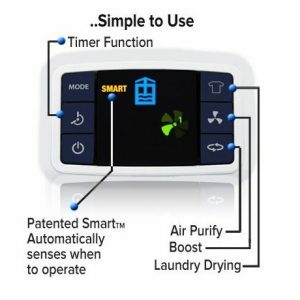 As you would expect from a modern dehumidifier, the Ebac 3850e also comes with a laundry drying mode and timer function (more on these features in the next section). The Ebac 3850e has a digital LED display, which is located on the front of the machine. This allows you to quickly see and adjust the various settings. Two Extraction Modes. The Ebac comes with two modes: Max and Smart. Max mode is effectively continuous operation. It’s great for bringing the humidity in a room down to manageable levels as quickly as possible, as it runs the dehumidifier on the maximum fan setting. The Smart mode, on the other hand, monitors external air conditions and only switches on when needed. This mode is great for automatically maintaining the humidity in your home without wasting energy. Timer Modes. Like most dehumidifiers, the 3850e has a timer function. There are options for 2, 4 and 8 hours, and the dehumidifier will switch off at the end of the timer. Selecting the timer is simple, as you can use the button to cycle through the three options. Laundry Mode. Like Max mode, this extracts water from the air as quickly as possible. You can combine it with the timer function so that it only runs for a set period of time. Fan Speed. The higher the fan speed the quicker water is extracted, but the louder the machine will run. Air Purification Mode. The Ebac includes an air purification mode. 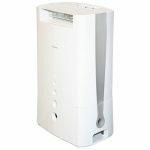 When activated, this stops the dehumidifier and instead focuses on removing allergens and other particles from the air. Unfortunately, you can’t run the air purification system at the same time as removing moisture, which makes this function of limited use. Standby Mode. When you hit the “Off” button, the machine goes into standby mode. We’re impressed by how simple the 3850e is to use. There are a variety of features available, but you won’t need to spend hours reading the manual to understand it. The 3850e is a relatively expensive dehumidifier. This is to be expected from a model with such a high water extraction rate. If you don’t need to dehumidify a large area, then a cheaper alternative may be just as good. If you have a large or very damp house, however, the Ebac 3850e still provides good value for money. The Ebac 3850e dehumidifier is an excellent choice for large homes. It can rapidly remove large amounts of moisture from the air (at least at room temperature or above), while minimising energy usage. It’s not perfect though. Considering the heavy weight and bulky exterior, we’re surprised Ebac didn’t include castor wheels. It’s also a relatively loud machine and the 2.5 litre capacity is small considering the high extraction rates. Even so, there aren’t many dehumidifiers that can keep up with the 3850e when it comes to water extraction in a warm home.